The Founding Committee of Athens College, which became its Board of Directors, was organized in May 1924. Its members were Epaminondas Charilaos, President of the Chamber of Commerce and Industry, Bert Hodge Hill, Director of the American School of Classical Studies, Stephanos Delta, retired businessman and treasurer of the Refugee Settlement Commission, Stavros Papadakis, Y.M.C.A. secretary, Emmanuel Benakis, retired businessman, former Minister and former Mayor of Athens, Petros Calligas, former Minister, Harold Jacquith, Director of the Near East Relief, Nicolas Kyriakides, shipowner. Later, Emmanuel Benakis who has been a major donator for the College, was named emeritus member and was replaced at the Committee by his son Antonios. The institution has been officially recognized with the title «Hellenic-American Educational Foundation». The courses began in October 1925 with 15 pupils (it was a school for boys). A building was rented at Androu Street for $215 per month, and Emmanuel Benakis and Stephanos Delta covered the first expenses (£2000). The first Headmaster of the College was the Englishman F. Stroud Read. The American Homer Davis, former teacher at Robert College of Constantinople, had in charge the English Department. Stephanos Delta provided for some years the needed funds for the operation of the School. In 1926 the Greek-American Evripides Kehayas, president of Standard Commercial Tobacco Co., offered $100,000 to the College. In January 1927, a “Board of Trustees of Athens College in Greece” was founded at New York. 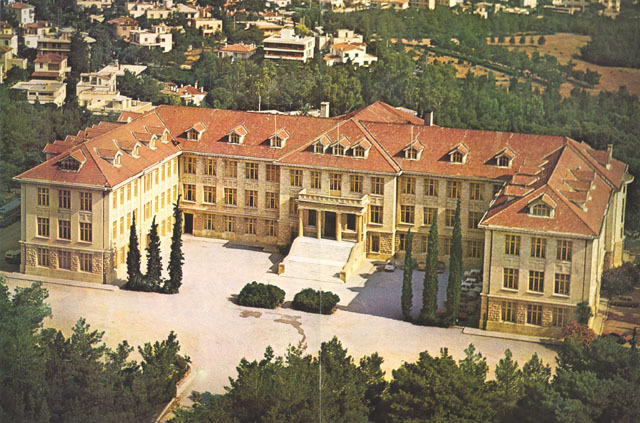 The same year, Emmanuel Benakis offered to the College another $100,000 to by land at Psychico, suburbs of Athens. Later, Benakis and Delta offered a huge supplement of $500,000. Other Greek personalities, as Eleftherios Venizelos, provided more funds. A new building began to be constructed in March 1927. Athens College begun its operation at the new building, called Benaki Hall, in autumn 1928, with 270 pupils, 91 being boarders. President of the College from 1927 was Dr. Henry Dewing. The official opening of Benaki Hall and of the Kehayas aisle took place in May 1929. In June of the same year, graduated the first five pupils. During the academic year 1930-31, the number of the pupils reached 351, and the number of professors 44 (9 were Americans, the rest of them Greek). A seventh year was then added to the six-year Gymnasium. This supplementary year will be a particularity of Athens College. During the 1930ies, the College had many economic difficulties, and new collects were then organized. With money from various sponsors, new buildings have been constructed, the library has been founded as well a scholarship fund. Homer Davis, who was Acting Director of the College after the departure of Dewing in 1930, was named its President in 1932. He will keep this charge until 1960, and will be Acting President in 1964-65. The Greek co-directors during those years, were Michael Michaelides-Nouaros (1925-27), Demetrius Georgakis (1927-36) and Emmanuel Troulinos (1936-62). The first school-laboratories have been organized in Athens College during the 1930ies, by professor of physics Panos Mavromatis. Four rooms have been provided for laboratories of physics, of chemistry, of biology and of geology. The experimental teaching has been from then a main educational policy of the College. From Athens College graduated many eminent Greek scientists, artists and politicians. This College has been an institution preparing Greek students to enter English and U.S. universities. Bibliographical note: For the history of Athens College until 1960, see Homer W. Davis, The Story of Athens College, The first thirty-five years, Athens College Press, Athens, 1992, 417 p.
The address of Athens College: Hellenic-American Educational Foundation, Athens College, P.O. Box 65005-15410 Psychico-Greece.